← Best defibrillator for all your needs! Year end is coming closer and only 65 days are left and in closing weeks we will start discussing what has been achieved and what not. 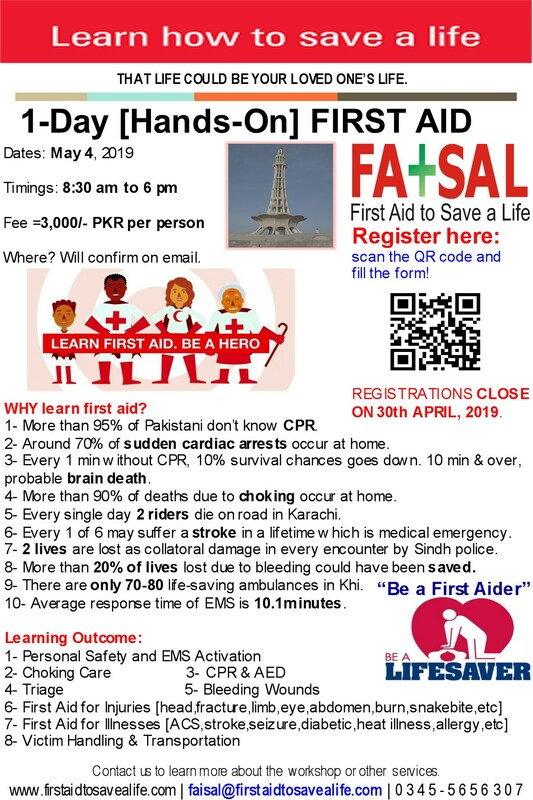 First Aid to Save a Life Pakistan would also like to share with our subscribers, online readers and web world, what others would like to share with them through us. So share your successful life saving stories, what you witnessed, where you supported the life saving attempts etc with us to circulate it to others around the world. Also share with us how you can turn the world around you and inspire others to learn basic life saving skills. I have heard lots of inspirational stories from our course participants those have attended the sessions because they wanted to learn and to help to save lives. Many of us need motivation to learn, so please let your words inspire them about the experiences you had in your life and let others think how they can do better than that. Some of us wanted to learn from others’ experiences, some wanted to learn by their own observations, some preferred to learn by formal education and someone is interested in informal learning. First Aid to Save a Life Pakistan wanted to support all of them. We want to tell them your stories on which they can lay the foundation of objectives of life saving skills; we can also arrange formal classroom or online learning environments for them. And at last we have detailed training and competency based life saving skills programs for the community groups and non-commercial organizations, medium and high grade students, students from universities and lay rescuers of all ages. These are designed to teach students how to perform resuscitation for patients of all ages who are victims of Sudden Cardiac Arrest (SCA), as well as those who are unresponsive or choking or bleeding etc. Here you will learn basic skills to save lives. We look forward to learn from your experiences and wanted to share your stories with others to learn by heart and remember what to do in difficult times. This entry was posted in Emergencies and Social Media, emergency care and first aid and tagged control of bleeding, cpr saved life, first aid saved life, first aid skills applied to save life, first aid stories, life saving stories, life saving stories from islamabad, life saving stories from jhelum, life saving stories from karachi, life saving stories from kashmir, life saving stories from lahore, life saving stories from multan, life saving stories from pakistan, life saving stories from rawalpindi, life saving stories from sialkot, share your stories, success life saving stories, unconscious patient recovered, use of aed saved life, want to share your stories, where you contributed life saving skills and saved lives. Bookmark the permalink.